"We have done three photo sessions with Doxa and have been absolutely thrilled with the pictures! Doxa has that magic touch for capturing the radiance in people. I am a very camera shy person but Doxa makes you feel so comfortable in front of the lens. Everyone who has seen our pictures think they are stunning! Thanks Doxa can’t wait until our next session!" "Doxa's pictures are wonderful works of art...she brings out the warmth and beauty of all those whom she photographs! They are truly memory keepers." "Doxa is unlike any other professional photographer I've ever used. She has such compassion and gives so much of herself. She drew out the best in my daughter and then captured these moment for us to cherish forever. She is a true professional. I highly recommend her." "Doxa is truly an Oakville treasure. She has the knowledge and love of photography that reflects in the images she produces. Her warm personality will always bring out the best in her subjects and we feel fortunate to have her take our family portraits. We look forward to working with her again." subjects and this in turn is reflected on her portraits. Above all she is an amazing photographer!" "Doxa – warm, professional, and talented – absolutely a pleasure to work with. Loved our portraits! Definitely will call on Doxa again for future family portraits." "Our family picture sessions with Doxa have been filled with fun and laughter. ...so much so that Doxa has always truly captured our children in their element...having fun!!" "Doxa's work on a keepsake of our daughter's Dance Career was much more than we ever imagined. The results prompted our Family Portait which is now the centre piece of our family room. Doxa certainly was able to present our daughter and entire family in a manner that we are proud to exhibit"
"Doxa doesn't just take pictures. She captures the spirit of her subjects. Her photographs are our treasures." 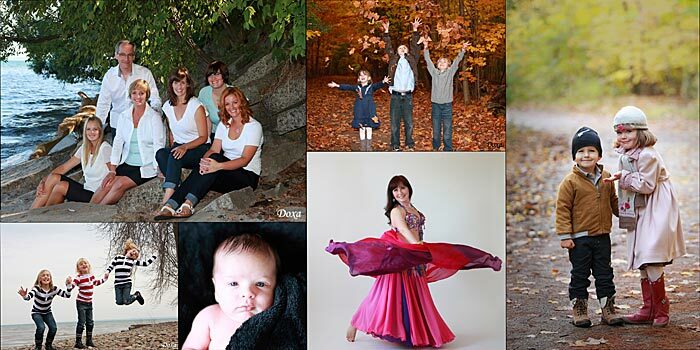 "Doxa’s use of natural light and her innate talent has produced very special images for our family. From the moment she steps behind her camera through to the finished work, her enthusiasm and creativity captures many treasured moments." "We would like to thank Doxa for giving our family a treasured memory. Doxa was highly recommended by a friend to do our family portrait. We were very pleased in the finished product. Doxa is so talented, kind patient and professional! There were five of us plus our dog. The dog was in almost every shot and our dog would make a fuss if she wasn't included. She captured many beautiful shots, so many in fact it was hard to choose. So we had a coffee table book made. Everyone that looks at this book of family treasures is in awe over the quality of these prints. Thank you Doxa, you are the best!" "Each time I look at our family portraits or those of my children, I am reminded of what a truly amazing job Doxa has done in capturing the true essence of our family. Friends and family continually comment not only on the quality of our photographs, but also on the added finishing touches that personify Doxa's work." "We would like to thank Doxa for the fabulous job that she did in capturing the spirit of our children. The pictures of our boys are priceless. Doxa brought so much life to the photos and they will be cherished forever!" "To say that Doxa is a gifted photographer is an understatement. She sees beyond the lens into the soul of her subjects and then captures the beauty for the rest of us to enjoy forever." "Doxa brings out that SOMETHING SPECIAL in the faces of our children. Doxa catches the moment and makes it our MEMORY!" "Doxa is a true professional. She made our family feel at ease with her warm smile and relaxing personality. She was able to capture the true essence of our family and her portraits hang proudly in our home. Doxa's talent is clear, every step of the way." "Doxa makes it personal, goes beyond your expectations and captures a moment in time that ensures it will never be forgotten." "Over the past few years Doxa has photographed all of the respective generations of our family and, in doing so, has captured treasured moments for us in her portraits: the gentle wisdom of a grandmother’s glance; the tender radiance of teenage daughter dressed for her prom; the loving embrace of a sister and brother; the gleeful delight of a grandchild’s smile. The stunning quality of Doxa’s portraits is as much a testament to her as it is to her subjects. In addition to the extensive technical expertise which Doxa brings to her art, she also brings a keen and genuine interest in all of the subjects of her portraiture, photographing each as if they were members of her own family. Doxa takes enormous pleasure in her photography and great pride in sharing the gift of her talent with others through her work. We are fortunate that she does: our family’s moments in time will live on through her portraits." "Doxa is wonderfully professional while relaxed and friendly. She not only makes photography effortless and fun, she spends a tremendous amount of time with you beforehand discussing the placement of your pictures as well as picking your favourites to design the ideal album. Doxa is full of great ideas, she takes so many lovely photos and captured our child and family brilliantly. We love looking at our beautiful album with family and friends, remembering so vibrantly all the special moments of our daughter's growth from baby to little girl. We couldn't recommend Doxa to enough people." "We highly recommend Doxa. She is knowledgeable, professional and knows how to set the mood to suit the family. Being a family of nine was a challenge Doxa handled with ease. From start to finish she made our experience fun and worthwhile. We will treasure our family portraits for a very long time. Thank you Doxa." "Doxa is a true professional whose keen attention to detail is what makes each portrait so special. Doxa is so kind, patient and wonderful to work with that even my children and dog enjoyed our photos sessions!" "Dear Doxa, You are a magician! The magic you produced for us in your studio and at the outside location on the trail gives us goose bumps. We are so happy with the group and individual portraits you have prepared for us. My childhood memories of family photo shoots are on par with going to the dentist. However, you have a natural skill which made us each feel special and happy. We didn't want the session to end. We will treasure these beautiful portraits and thank you for these great memories." "Working with Doxa exceeded all of our expectations and previous experiences! I could see from her website that she does beautiful work and she is very talented, but the real magic is to see her in action taking the pictures and then to work with her to select the right images and preserve the memories. Doxa is patient, warm and always brings out the best in her subjects. She has a real eye for a great shot and a wonderful way with people - my children really responded to her kind and patient ways and you can see that in the portraits. I love that she captured the spirit and vitality of my family in the photographs - and the compliments we get on the photographs are proof enough that she's able to get something special. Thank you Doxa for your excellent work - I am looking forward to having you continue to record our family in portraits!" "Doxa’s unique ability to capture our children’s personalities in her photos is truly a gift. I wouldn’t have anyone else photograph our family." "Doxa is an amazing photographer. She takes pictures from her heart and it becomes a story for others to see."